Orientation provides some roadmap to Albany’s byzantine legislative processes, including workshops in drafting bills, organizing a press conference, and conducting research, and legislative staffers are provided for support, but it can take a few weeks, if not months, for newly minted politicians to fully acclimate to life as a state lawmaker. In fact, much of the training happens on the job, according Assemblymember Tom McKevitt, who oversees the trainings for incoming Assembly members in the chamber’s Republican minority. All new legislators in the Senate and the Assembly receive mandated training when they begin their legislative careers in Albany. In addition, each party conference provides training, as McKevitt indicated for the Assembly minority. This year, there are 10 new state lawmakers from New York City, joining the 150-seat Assembly, which is dominated by Democrats, and the 63-seat Senate, which is narrowly controlled by Republicans. All of the new reps from the city are Democrats -- there are only a handful of New York City Republicans in the Legislature altogether, mostly from Staten Island. 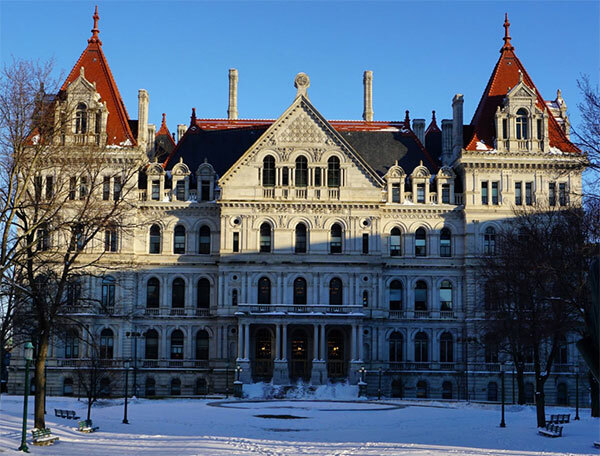 Gotham Gazette began interviewing each of those 10 new members in February to gauge how they are adjusting to life in the state Legislature, which is notoriously dysfunctional and insulated, and has seen its share of corruption scandals in recent years. While the first weeks of the legislative calendar leading up to one-house budgets in March are always fairly intense for new legislators, this year appears to have been more so. As with other state capitals and city halls around the country, the inauguration of President Donald Trump, followed by the unconventional president’s chaotic first two months in office, have cast a long shadow over governing in New York. As the Trump administration rushes to follow through on campaign promises to scale back reproductive rights, repeal the Affordable Care Act, and ban immigrants from select countries, many legislators, especially Democrats, are feeling more uncertainty and a greater sense of urgency. Both come in part from their constituents -- New Yorkers who overwhelmingly voted for Hillary Clinton in November. Several incoming lawmakers hailing from the five boroughs are facing challenging political climates in their districts and given local political dynamics. Yuh-Line Niou, now representing Lower Manhattan’s 65th Assembly District, must deliver for a constituency accustomed to receiving an exceptionally high level of resources given that the seat had been held for decades by (now convicted) former Assembly Speaker Sheldon Silver. The 31st Senate District’s new representative, Marisol Alcantara, is a member of the Senate’s Independent Democratic Conference (IDC), at a time when the breakaway group of Democrats that forms a coalition majority with Republicans is facing some significant backlash. Meanwhile, Senator Jamaal Bailey, of the 36th Senate District, is joining the mainline Senate Democratic Conference that is struggling in the minority. To begin our series on new city-based state legislators, Gotham Gazette spoke with Niou, Bailey, and Brooklyn Assemblymember Robert Carroll. Read their interviews through the links below, and stay tuned for our interviews with the seven other new lawmakers from the five boroughs. The District 9 seat in Harlem was recently vacated by Inez Dickens, who was elected to the state Assembly, leaving just one year left in the term. A nonpartisan special election for the seat was held on Feb. 14 with nine candidates on the ballot. State Senator Bill Perkins, who held the District 9 seat between 1998 and 2005, won with 3750 votes, about 34 percent of the 11,149 votes cast, according to the New York City Board of Elections’ unofficial results (Final results are certified two weeks after the election). Perkins will serve the rest of Dickens’ term and will have to run for reelection, which will involve a Democratic primary in September. 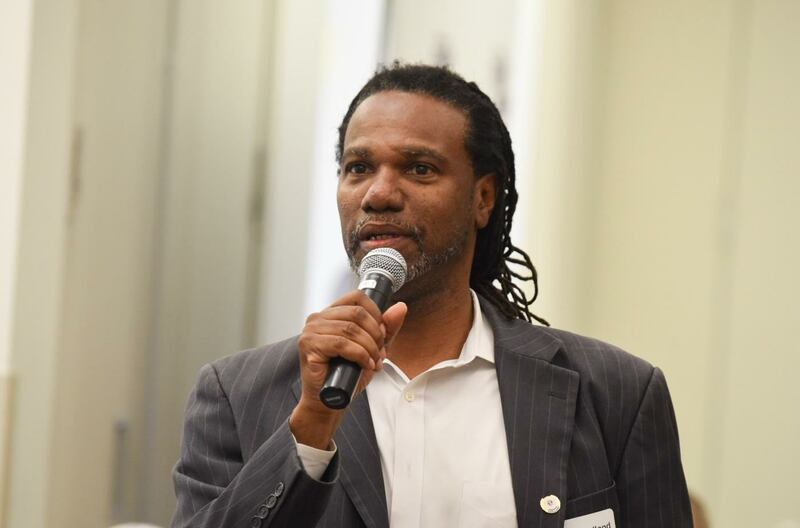 As political director of Transit Workers Union Local 100, Holland built a coalition of labor and community support and his vote totals even surpassed Larry Scott Blackmon, the favored candidate of the Harlem old guard. Blackmon, a FreshDirect executive, came in fourth in the race with 1,324 votes, despite being endorsed by Dickens and former Assemblymember Keith Wright, who chairs the Manhattan Democratic Party. Holland’s campaign pointed out that 66 percent of the voters didn’t choose Perkins, despite his long history representing the neighborhood and his familiarity in the community. “So, their vote could have been an anti-Perkins choice,” said Jon Greenfield, a spokesperson for Holland, in an email. Greenfield said the race ultimately hinged on name recognition and that Holland can spend the next six months building his own. “Marvin can hold his showing in the East Harlem portion of the district (Assembly District 68), build name recognition in central Harlem over the next months, and gather anti-Perkins, anti-establishment votes,” he said. The race will still be an uphill challenge for Holland. 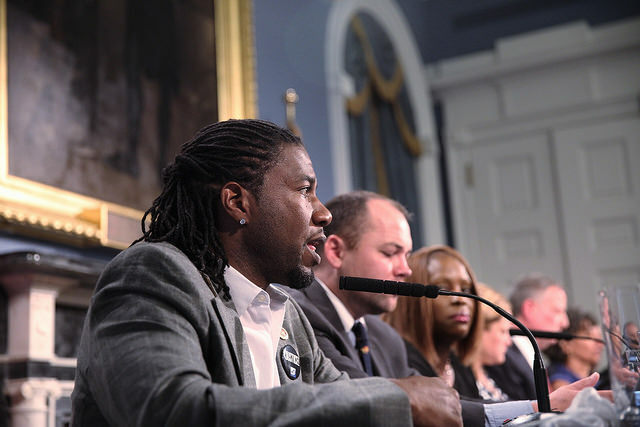 Perkins received endorsements from Mayor Bill de Blasio and the City Council’s progressive caucus in the special election. He’s confident that he will be reelected and hopes to do as well in September as he did in the Tuesday special. “I have every reason to believe I’ll do even better,” he said, in a phone interview. He wasn’t surprised to hear Holland will run against him, and even welcomed the challenge. “I wouldn’t be surprised if any of the other candidates that participated in the election are considering the same thing,” he said, insisting that he doesn’t take his frontrunner status for granted. Only one other candidate, Shannette Gray, has officially declared a run for the District 9 seat with the Campaign Finance Board. She did not participate in the special election. Before Assemblymember Keith Wright had conceded to Sen. Adriano Espaillat in their congressional race, speculation had already begun about which seat Wright would seek next if not victorious. Wright eliminated one option when he pledged in the heat of the race to replace retiring Rep. Charles Rangel that he would not seek reelection to the Assembly seat he has held since 1992. Wright challenged Espaillat to do the same as the state senator had repeatedly run for Congress only to return to the state Senate. Espaillat ignored the challenge. 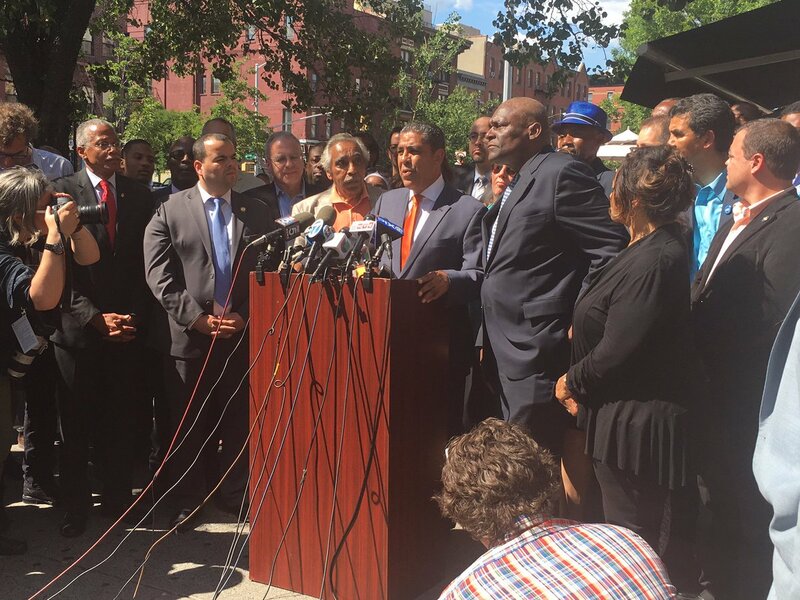 On congressional primary day in June, Espaillat claimed a narrow victory, leaving Wright calling for a recount, but soon community leaders brought pressure on Wright to move on and accept defeat, which he did. No political observer believed the pledge would keep Wright, a close ally of Gov. Andrew Cuomo and one of the state’s most powerful Democrats and most prolific fundraisers, from seeking public office again. Now that state legislative primaries are over, another Wright ally, City Council Member Inez Dickens, appears set to replace him in the Assembly. She ran unopposed among Democrats for Wright’s seat, raising a few eyebrows given that seats being vacated often attract multiple candidates. While initial rumors focused on Wright running for the State Senate or Dickens’ City Council seat, The New York Post recently reported that Wright associate Charlie King is trying to gauge reaction and garner support for a Wright mayoral bid. Wright’s office didn’t do much to downplay the possibility of a challenge to fellow Democrat Bill de Blasio, who is poised to run for re-election in 2017. Although Wright wasn’t made available for an interview, spokesperson Emma Forbes sent a statement to Gotham Gazette implicitly confirming his interest in the mayoralty. “Keith's always been an advocate for all New Yorkers, and especially for Communities of Color,” Forbes wrote. “I think that when you look around today and see many shared concerns and challenges left unaddressed, it makes you consider the role you have in fixing things in government, be it appointed or elected, city or state, big or small." As chair of the Manhattan County Democrats, Wright wields significant power and influence, and many observers believe he could easily clear the Democratic field in a special election to replace Dickens in the City Council. And if he wasn’t able to intimidate or convince all other potential candidates from running, Wright has access to the forces he would need to quickly raise money and marshall overwhelming turnout for the special election, which would likely take place in March. Wright has brought his power to bear on past elections; in some cases he has been accused of unfairly influencing certain contests. While a mayoral run is probably less likely than a City Council one, the speculation does not end there. Wright is also touted as a possible replacement to Sen. Bill Perkins, who in such a scenario would run for and win Dickens’ Council seat, leaving his seat open for Wright. Perkins did not return calls for comment. Concerning speculation about Wright’s legislative ambitions, Forbes said in a statement, "All options remain on the table, and the Assemblyman is carefully considering the best way to continue positively impacting the community that he loves." Dickens noted that she will be term-limited out of the Council at the end of next year. She speculated that she faced no Democratic challengers for Wright’s seat - which is centered in Harlem and represents almost exclusively Democrats - because of a number of factors, including the trips Assembly members must make to Albany, the last-minute nature of the opening, and what she said was insufficient pay for state legislators. “We’re asking young people to go to college, get degrees, have bills they have to pay for it after they come out of school, have a family, have children that they have to take care of properly, and then tell them they have to live on $79,000 a year. The idea of free public service is over,” Dickens told Gotham Gazette. At this point in the process it appears there are a variety of contenders considering a run Dickens’ Council seat. As of July, four candidates had registered with the city Campaign Finance Board. 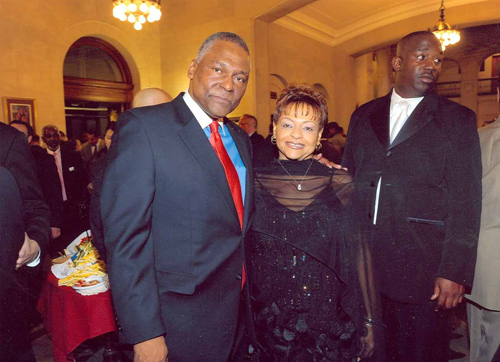 One of those registered candidates, Charles Cooper, a businessman from Harlem, told Gotham Gazette that he expects a crowded field. “This is a Democracy and I welcome everyone. I am going to focus on uniting the community,” Cooper said. Asked if he was concerned about the prospect of Wright entering the race, Cooper said he respects Wright, but that it wouldn’t impact his plans. Other registered candidates include Marvin Holland, an organizer for the Transportation Workers United union; Donald Fields, a businessman and advocate; and Shanette M. Gray. Fields is the only registered candidate to report any fundraising, but he’d raised $165 as of July. A number of other names are being bandied about as potential candidates. They include Clyde Williams, who also ran to replace Rangel this Spring; Afua Atta-Mensah, a lawyer and former district leader candidate; and Sen. Perkins’ chief of staff Cordell Cleare. When Dickens officially wins the Assembly seat in November, she’ll be set to replace Wright come January, and the machinations for a special City Council election will begin. Espaillat and his allies are paying close attention to Wright’s moves as they hope to curtail any major challenges to his newly-won seat before they happen. Espaillat will be up for re-election in 2018. A number of Wright’s allies insist he is still weighing whether to enter the private sector and spending time with his family, They say there is no bigger master plan at this point. To launch a campaign for any of the seats being mentioned, Wright would need to kick his fundraising apparatus into high gear quickly, although it would likely be far easier for him to raise the funds needed for a Council or state Senate run than a mayoral bid. Wright’s Assembly campaign committee filed “no activity” statements with the state Board of Elections in January and July. Wright raised a total of $934,138 for his congressional bid, compared to Espaillat’s $628,000. There is little doubt among political experts that Wright could secure the cash he needs to run a well-financed legislative campaign. 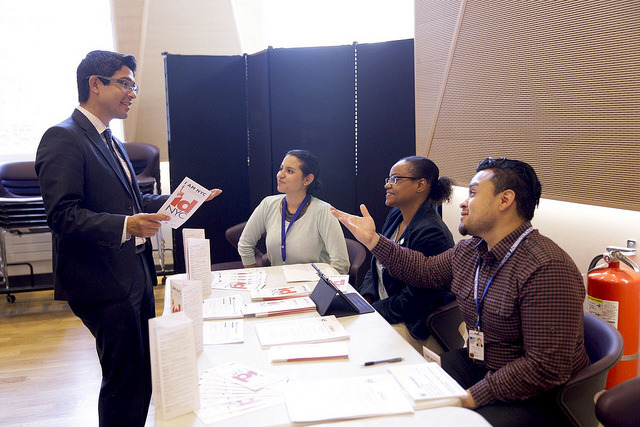 For City Council Member Carlos Menchaca and his staff, the Participatory Budgeting Vote Week that just ended was the culmination of a year-long effort to encourage project proposals and votes from communities that are traditionally excluded from politics. Through PB, community members decide how $1-2 million in funding is allocated toward neighborhood improvements. Menchaca’s district, which includes immigrant-rich Brooklyn neighborhoods of Sunset Park and Red Hook, is one of 28 districts running the program in the 51-member City Council, but it is the most active. Last year, Menchaca’s constituents recorded the city’s highest number of participatory budgeting (PB) votes, a total of 6,299. Although this is double the amount of voters from the prior year’s cycle, it is still only a fraction of eligible voters, as the district has a population of 164,230 — about 80% of which is over the PB voting age of 14, according to the 2010 census. Still, two-thirds of the votes from those who chose to participate were on non-English ballots and almost one-quarter were from people who couldn’t vote in regular elections, such as people under the age of 18 and immigrants without U.S. citizenship. These data give Menchaca and other supporters of PB energy to push forward despite criticism of the program. “What we’re doing with PB is removing as many obstacles as possible to get every voice in the community connected to a decision, like a community project,” Menchaca told Gotham Gazette in an interview during vote week, which was March 26-April 3. Menchaca and other Council members typically begin the PB outreach process in September, when workshops are held for residents to come together and share ideas about what should be improved or changed in their communities. This year in Menchaca’s district, fully translated workshops were held in Spanish and Chinese. Throughout the year, regular updates on scheduled events are sent through more traditional methods like phone calls, text messages, and emails. Residents are also updated via social media outlets like Facebook, Snapchat, and Twitter. A voting site at the Red Hook Initiative community center, run by volunteers from local high schools, forecasted some success for Menchaca’s community outreach efforts as excited teenagers encouraged their friends to vote. These youth organizers had also been working throughout the year by attending training sessions, collecting project proposals, and organizing mobile voting locations. 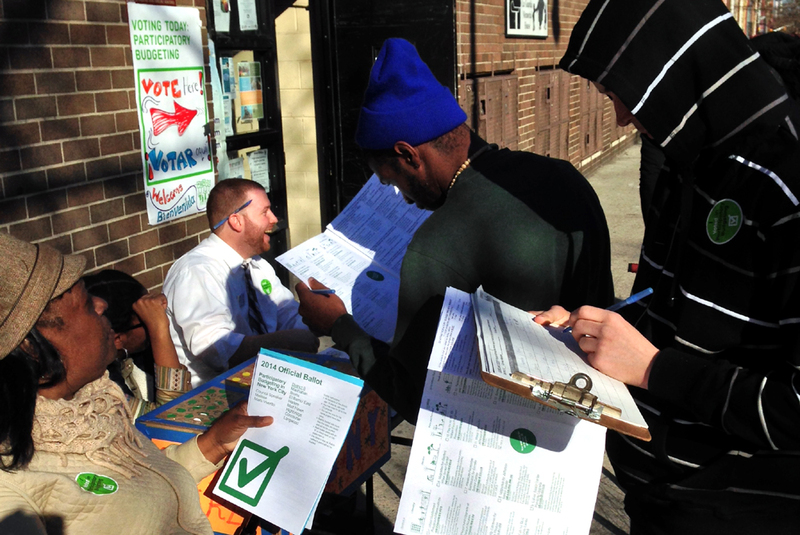 When they set up their Red Hook Initiative site, they were determined to collect 1,000 ballots by the following day. The majority of volunteers and voters at the vote week event would not have been eligible to participate in a regular election because of their age, but PB votes are open to residents as young as 14. Tea Cruz, a 16-year-old student, voted with her younger family members in mind. She wanted the local playgrounds to be renovated so that the equipment isn’t rusty and broken when her newborn cousin is old enough to play there. She was also concerned about her younger sister’s middle school, where the library is too outdated for the students to find their books easily. Along with playground renovations and new library technology, there were 11 other projects on the District 38 ballot this year. Other school improvement proposals included air conditioning installations, lockers for students who are currently required to carry their belongings with them throughout the day, and repairs to auditoriums, bathrooms, and science labs. Brooklyn Community Boards 6 and 7 called for street repairs, including filling potholes and repainting lines. There were also two district-wide proposals for new trees throughout each neighborhood and electronic signs at bus stops with the location and arrival time of each bus. PB projects are only for these types of physical investments in a neighborhood, known as capital projects. Critics of PB say that many these are projects that city agencies are supposed to take care of through the normal city budgeting process, and that the role for Council members it is to be a liaison between their communities and city agencies, while also influencing the overall city budget. Still, Council members do receive funds to disburse in their communities and many members are now allowing their constituents control over a portion of those funds. In Menchaca’s district, each voter could support up to five different projects. Informational expos were held before and throughout vote week for residents to learn about each proposal. At the Red Hook Initiative site, a room in the community center was filled with colorful science-fair style posters made by young volunteers, detailing the potential benefits and costs of each project. Voters were encouraged to read all the information before handing in their ballots. Many of the teen-aged voters lingered in front of the posters, questioning details of each project. Youth Council Member Frank Edwin Guzman, Jr., who is mentored by Menchaca, thinks that the perspectives of his peers are an important part of improving the community. After entering the New York City Youth Council program, his goal is to eventually be the youngest Council member in the city (Menchaca is currently among the youngest). In the near future, Guzman would also like to see every City Council member running PB. Menchaca also hopes to see more City Council participation. Although 28 districts in New York City already run PB, the system still faces some criticism, both from within and outside the Council. In a recent column, NY1 Political Director Bob Hardt argued that PB places too much of the Council member’s responsibility on residents and hurts the poorer parts of districts that aren’t usually politically involved. Menchaca finds that PB has the potential to do the opposite if the right effort is made. Menchaca also responded to the criticism that PB takes power away from Council members. “What we’re trying to do is not consolidate power for one person to make decisions or go out and find solutions, but what we’re doing is actually increasing power within the community to develop leaders who are knowledgeable of city agency processes to help make a collective decision about where to place dollars,” he said. Other critics point out that the entire PB process might be unnecessary. In a recent column for the New York Daily News, NY1 political anchor Errol Louis pointed out that PB only makes up 0.04% of the city’s budget, labeling the process as “painfully low-stakes.” He argues that if it were really the great process participating Council members promote it to be, residents would be allowed to vote on billion-dollar decisions, rather than where to allocate $1 million or $2 million. Louis also echoes Hardt’s point about putting decision-making responsibilities into the wrong hands. “And if a budget decision goes wrong — if, say, events prove we should have bought NYPD cameras instead of renovating the senior center — participatory budgeting scatters the responsibility, letting the Council member off the hook,” he wrote. In an article published here last year, Council members not running PB in their districts cited the heavy commitment as a deterrent. “Participatory budgeting takes an extraordinary amount of office time and resources for no discernible improvement in outcomes over working through the existing vast civic infrastructure for public participation,” said Council Member Rory Lancman, who represents District 24 in Queens. 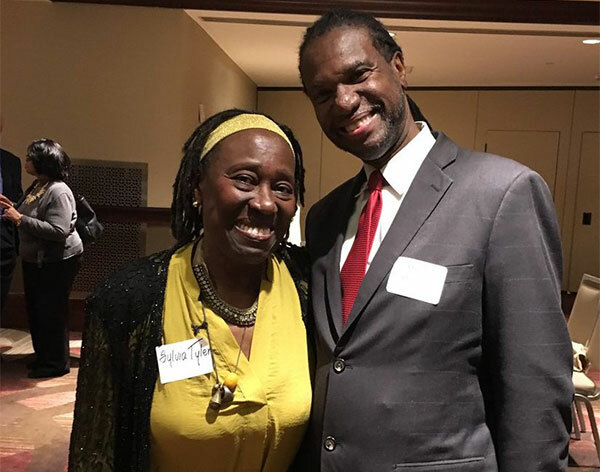 A press secretary for Council Member Inez Dickens, representative of District 9 in Harlem, explained that local community boards are the most practical way for residents to express the same opinions, concerns or proposal ideas that PB encourages. This was a point raised by Louis in his recent column. As more City Council members decide whether or not to run PB, Menchaca thinks that the future of the program lies in more funding. Last year, a project for increased Wi-Fi throughout the NYCHA public housing developments in Red Hook couldn’t receive PB funding even though it garnered more than 3,000 votes. 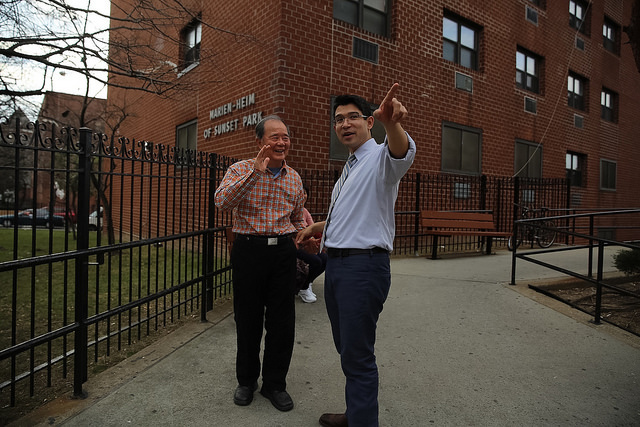 Menchaca had already allocated all of his available funds to winning projects such as district-wide technology updates, playground lighting, bathroom renovations, and outdoor fitness equipment in Sunset Park. He went to Brooklyn Borough President Eric Adams, who was able to expand PB this year with a commitment of an extra $100,000 to 10 different districts, for a total of $1 million, to support winning projects. Adams is the first borough president to make such a funding decision. “PB is a revolutionary approach to growing democracy from the ground up, and this partnership with the City Council will cultivate that growth even further, funding more capital projects and engaging more potential voters,” Adams wrote in the press release. Along with the continued support of the borough president, Menchaca would also like to encourage the mayor’s office and more city agencies, such as the Parks Department, the School Construction Authority, and the Department of Transportation, to look to PB votes for ideas about how to spend their own money. He believes that PB could be a valuable resource for the mayor’s office and its agencies by showing the city government what residents really want and need, therefore creating a more direct relationship between city agencies and residents. If the city were to directly increase PB funding, it could help improve outreach efforts, according to Menchaca.